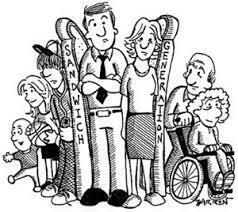 The term “Sandwich Generation” refers to the phenomenon in the U.S. and many Western countries where a large and ever-growing percentage of the population provides care for their aging parents or relatives in addition to their children. In some cases, young adults who finally establish independence get thrown into a world of full-time accountability before children are even a consideration. The issue is not so much about finances (although it can be), but rather the stress and strain of continuing to spend time and attention on someone other than yourself or spouse. The independent family nature of Western culture plays a big role in explaining why eldercare is so stressful. Countries such as Japan, Vietnam, Scotland, and China all share similar cultural values that place a premium on caring for the aging, making the process easier for all parties involved. In China, for example, respecting the elderly is part of the law, and elderly parents can sue their grown children for both emotional and financial support. Companies are even required to give workers time off to visit their parents. As a result of this cultural and legal obligation, many parents live with their children, making it easier to be cared for, and therefore reducing the stress of their loved ones. As we meet with clients, this is a topic that continues to present itself and does not appear to show signs of slowing. This week we would like to share an article we came across on Care.com which addresses tips for managing stress when you find yourself being “sandwiched”. Care.com was originally created to match parents with caregivers for their children, but has recently expanded to include a section with caregivers for the elderly. The high demand for this service is a sign of the times.